WELCOME TO MY MUSICAL ILLUSTRATIONS PAGE! This page is dedicated to progressing shortcuts in musical evolution through the use of visual guides. The images provided integrate traditional Western musical knowledge with visual exploration you haven't seen before. Music is everywhere, on the radio, on the television, in the wind blowing in the trees, in the vocal compositions created from the tones of voice expressed within someones emotional conversations. It is a common language that every culture in the world has. The philosophy I carry is that everyone is capable of expression, so why should expression for music only be exclusive to those with musical upbringings and those naturally wired to understand sound. With that, these illustrations provided are my attempt to evolve music into a common method of communicating the deeper levels of the soul, which should be accessible to every soul within every person. All illustrations are available for personal use and growth. They are released as open source material, however all copyrights are held. These documents may not be bought or sold, or included in limited access package deals where the release of grouped material is based on financial transactions. Thank you for your cooperation! Enjoy. Some Recent Music Illustrations for chords and guitar. 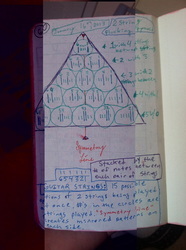 15 Patterns of 4 strings that can be played on the guitar. Left and right are symmetrical. 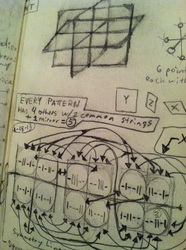 2 un-played notes forms the 15 patterns of 2 strings on the guitar. CHAKRA CHORDS!! 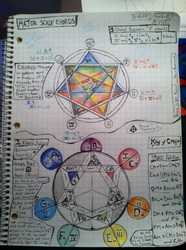 24 Chords/ 12 Major and 12 Minor from the 24hr Chord Clock overlapped with the Chakra energy system. It uses a traditional approach a the C note as the Root Chakra and C Major scale as the Major Chakras. Symbols on right align with the functions of the chakras and bridge chakras. Each chord can then be defined by which energy centers they activate...in theory. Semi-Older Illustrations to Older illustrations. This Illustration is one of my latest creations. It had manifested from cycling the chords of Major and minor by taking away the lowest note and placing a new note on the top following the pattern of Major and minor. ie: CEG=> EGB=> GBD=> etc.. If you have never played music before and have a piano, it should be fairly easy to figure out be just matching up the descriptions and visuals to a piano. 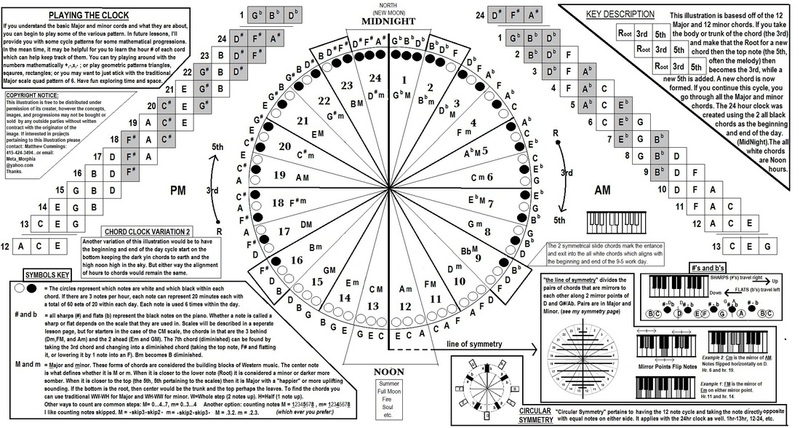 It is a great way to keep track of all the Major and minor chords through pairing them up the the cycles of a 24hr clock. SYMMETRY CONCEPT using the mirror or flip points on the piano. This illustration was created back in 2006ish with personal explorations of the concept of symmetry and how it can apply to all facets of our life. 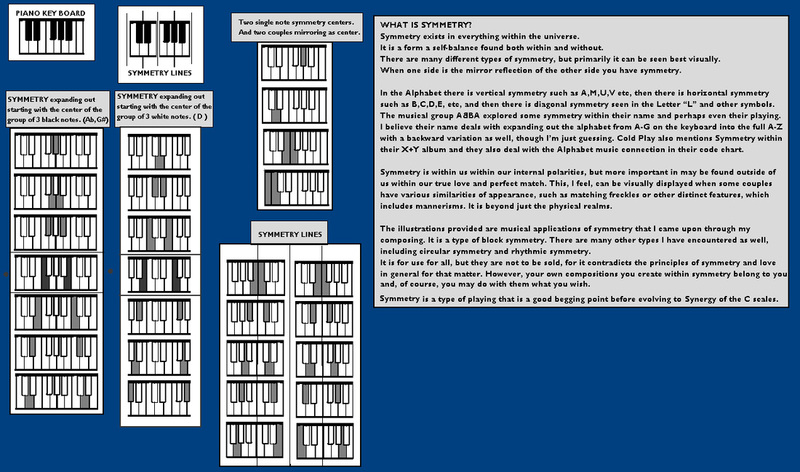 This is a simple visual guide to understanding the basic concepts of it upon the piano. There are other concepts that will assist in transforming it into musical evolution not included here, but here is a way to start. This illustration was done back in 2002ish and recreated on computer in 2005ish. 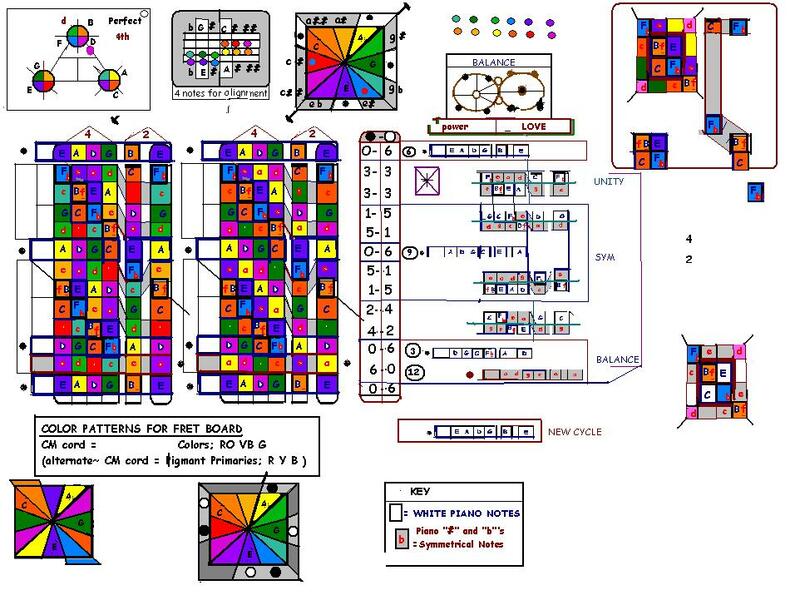 It uses the concept of the 12 spoked color wheel overlapping with the 12 note octave. The color fret board on the right shows the circle symmetry points on the notes directly on the other side of the 12 note wheel. 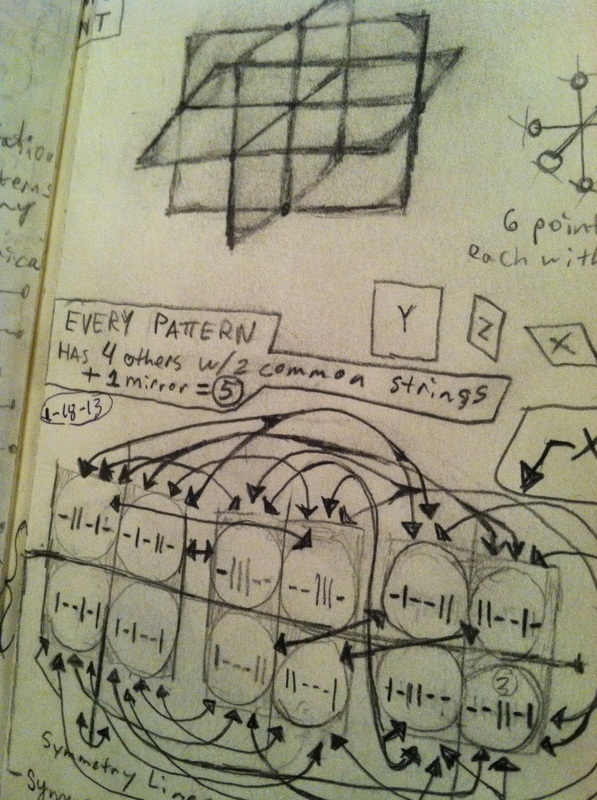 ie: 12 O'clock and 6 O'clock, 1-7, 2-8, etc.., the diminished 5th or augmented 4th as sometime referred to. The guitar pattern seen in black and white on the far left, is simply an overlapping of the black (seen as grey) and white notes on the piano onto the fret board. 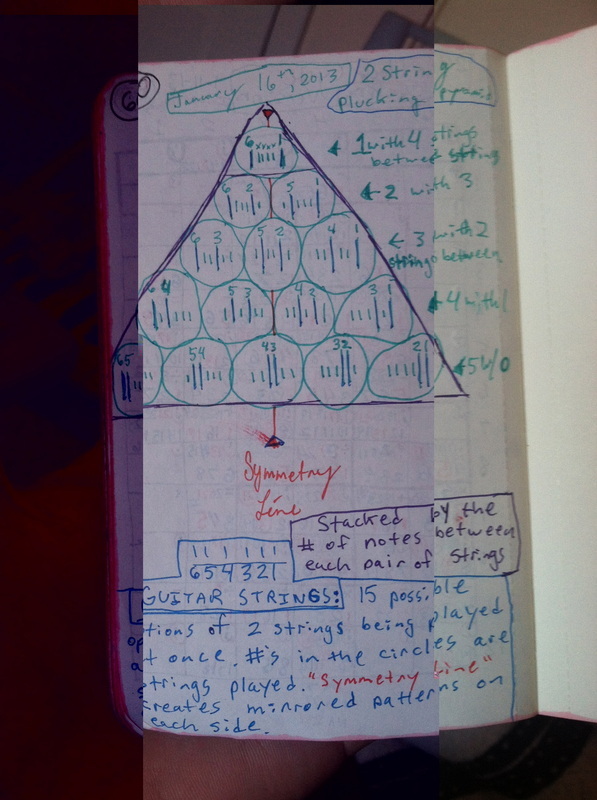 I have divided it up into symmetrical patterns of black and white... so if you have a pair of two rows (1rst and 2nd fret) and there is a white note on top then you will see a black note just below and visa-versa. It is a way to learn the #'s/b's on the fret board.